BACKGROUND: Suicide Attempt is a self-inflicted, potentially injurious behavior with a nonfatal outcome for which there was evidence of intent to die. Life changes could act as a stressor causing enhanced susceptibility for suicidal risk. Suicide is a complex public health problem due to interactive social, cultural, biological and psychological risk factors. AIM: To study suicide intent and it's association stressful life events in subjects with suicide attempt. MATERIAL AND METHODS: The study was cross-sectional, non-interventional study which included 102 patients. Semi-structured Performa including socio-demographic and clinical history details, Presumptive Stressful Life Events Scale (PSLES) [Singh et al., 1984] was used for assessment of psycho-social and adverse life events and Beck suicide Intent Scale was used for assessment of suicide intent. Data obtained was analyzed using appropriate statistical tool. RESULTS: Statistically significantly higher suicide intent was present in males (P = 0.001), age group 31-45 years (P = 0.043), Earning group (P = 0.008), family income <10000 per month (P = 0.028), family history of suicide attempt (P = 0.028), past suicide attempt (P < 0.001) and subjects having psychiatric illness (P < 0.001). On applying Pearson's correlation , strong correlation was found between stressful life events score and suicide intent score (r = 0.705, P <0.001). CONCLUSION: Male gender in age group 31-45 years had higher suicide intent The earning group had higher suicide intent as compared to non earning group. Higher suicide intent was present in subjects having positive family history of suicide and history of prior suicide attempt. Study reported strong co-relation between Stressful life events and suicide intent score. Stressful life event score was significantly higher in subjects having psychiatric illness and past history of suicide attempt. The increasing rate of suicide and suicidal attempts is a growing health problem worldwide. According to the World Health Organization, suicide is the second leading cause of death among people aged 15–29 years (2012). It is responsible for 1.4% of all deaths worldwide. The International Statistical Classification of Diseases defines that suicide combines the deaths where the underlying cause is intentional self-harm (ICD10: X60-X84), events of undetermined intent (ICD10: Y10-Y34), and the result of intentional self-harm/injury/poisoning of undetermined intent (ICD10: Y87.0/Y87.2). It is estimated that approximately 10%–15% of persons attempting suicide ultimately die from suicide. Suicide is historically largely been influenced by sociocultural beliefs, for sake of respect, honor, and the motive of sacrifice apart from psychiatric comorbidities or other causes. India is an agrarian country, but for the last two to three decades, the number of farmers committing suicide has been significantly increased. There are a number of conflicting reasons responsible for this such as high debt, monsoon failure, and personal and family issues. Suicide attempts are related to many psychological and medical conditions such as young age, female gender, and psychological disorder. Suicide is strongly associated with a history of suicidal behavior in the past, as 50% of people who commit suicide have a history of suicide attempt. Persons who survive after a suicide attempt are at high risk of suicide in later life. Research suggests that risk factors for suicide include biological, psychological, and socioenvironmental factors. Recent work points toward interactions between the above-mentioned risk factors in the causation of suicide. However, much data are not available regarding how these factors are correlated and influence each other. Temporal variation in suicide risk has been explored in multiple studies over many years (Ajdacic-Gross et al., 2003). It is likely that the timing of suicide varies according to geographical and sociocultural context. As well as being of theoretical interest, this information may be practically helpful as it may indicate vulnerable and risk period for suicide. With this view, the present study is planned to find the sociodemographic, clinical correlates and temporal variations in individuals with suicide attempt. This study will further add to the literature regarding the various aspects of suicide. This was a cross-sectional, observational study. All the participants enrolled in the study had given informed consent before inclusion in the study. The study was carried out from September 2017 to August 2018 after approval from the Institutional Ethics Committee. The sample was drawn from patients referred to adult outpatient department and Emergency Services of the Department of Psychiatry, of a tertiary care center of North India from other departments for the purpose of evaluation of attempted suicide. Patients were screened for selection criteria and participants having age >18 years, ability to speak and understand Hindi, and willing to give informed consent were included in the study. Participants who were under trial, convicted or referred by the court of law, nonavailability of reliable informant, individuals having dementia or subnormal intelligence on clinical assessment, and participants having an unstable medical condition resulting in the inability to participate in study assessments were excluded from the study. A total of 102 participants fulfilling selection criteria were recruited after obtaining written informed consent from patient/informants. Following enrollment, semi-structured Performa was used to record the sociodemographic and clinical profiles, including the checklist for temporal variation, the method of suicide attempt, physical comorbidity, past attempts, precipitating factors and family history, and clinical details of the patients. MINI v 6.0.0 by Sheehan et al. (2009) supplemented by SCID I and assisted with clinical interview was applied to screen psychiatric comorbidities which were later confirmed on ICD-10 DCR. The data collected were tabulated using computer software and statistically evaluated using SPSS v20 IBM SPSS Statistic 16.0.0 (IBM Corporations, Somers, New York, USA). The Kolmogorov–Smirnov test was used to check whether given data set could have been drawn from normal distribution, and the data were found to be normally distributed. Independent samples t-test and analysis of variance were used to compare continuous variables between groups formed according to the sociodemographic and clinical variables. Tuckey's post hoc test was used for intergroup comparison of continuous variables. The study included a total of 102 participants comprising both males and females with slight preponderance for males (52%). Most of the participants belonged to 31–45 years age group (53%) were Hindus (84.3%), married (74.5%), and representing almost equally the rural (49%) and urban (51%) population and nuclear (42%) and joint (57%) family structure. Homemakers (27.5%) of the sample and clerk/shop owner/farmer (23.5%) formed the major occupational group. Most of the participants had received more than 10 years of schooling (49%) and most participants (54%) belonged to the income group ≤Rs. 10,000/month. Mean participant and family income per month were Rs. 7135 and Rs. 10816, respectively. The clinical variables of the sample show that the psychiatric illness was present in 35% of the participants with adjustment disorder being the most common (21%) followed by substance dependence/harmful use (6%), depression (5%), psychosis (2%), and bipolar disorder (1%). About 20% of participants had comorbid physical illness, 6% of participants had a history of prior suicide attempt, and 6% had a family history of suicide and about 3% of participants had a family history of psychiatric illness [Table 1] and [Table 2]. Reported antecedent event just before the suicide attempt was family problems (33.3%), marital problems (24.5%), financial problems (19.6%), illness-related problems (8.8%), love affair (4.9%), examination-related problem (2.9%), and property dispute in one participant [Table 3]. Common mode of suicide attempt was poisoning, chemical (44.1%), and corrosive (10.8%), followed by hanging (39.2%), exsanguinations (4.9%), and firearm injury in one participant [Table 4]. As per the frequency of suicides attempted during various time periods of the day, majority of suicides (55.90%) were attempted between 6:00 PM and 11:59 PM, followed by 30.40% between 12:00 PM and 5:59 PM and 12.70% between 6:00 AM and 11:59 AM. 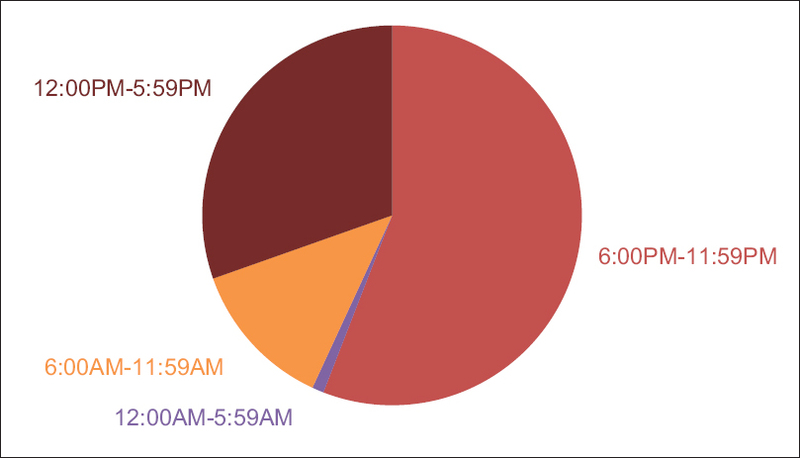 Only one participant attempted suicide between 12:00 AM and 5:59 AM [Figure 1]. As per the frequency of suicide attempts on different days of the week, Saturday remains the most common day for attempted suicide 20 (19.6%) followed by 16 (15.7%) each on Sunday and Friday [Figure 2]. As per suicide attempts during various months of the year, maximum number of suicides (10.7%) was reported in January, December, and July and the least number of suicides (2.90%) in September. 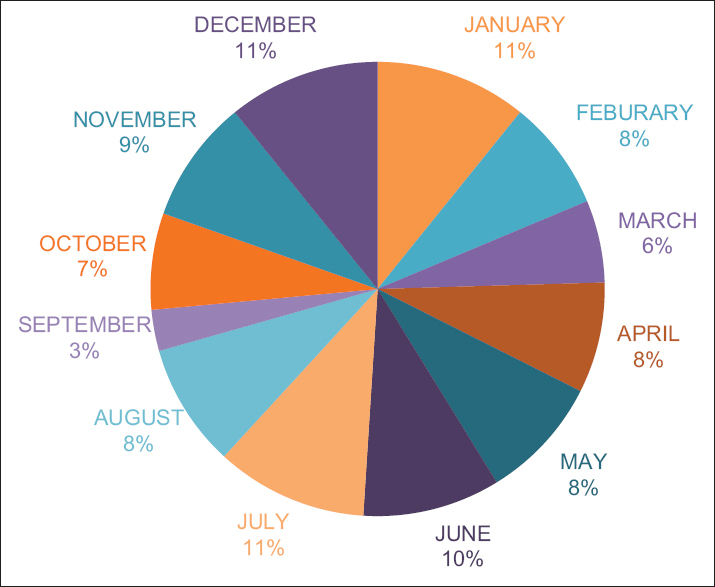 Significant peak of suicide rates was seen in extremes of weather which is around 20% in June and July and around 21% in December and January [Figure 3]. In this study, majority of participants lie in the age group of 18–45 years. In a study by Menon et al., the age of first suicide attempt with a cutoff of 31 years for the two subgroups was studied. In logistic regression analysis, male gender, fewer years of formal schooling, and being married were more commonly associated with the late-onset subgroup (age at first attempt >31 years). Our study sample consisted of 52 male and 50 female participants. This finding is consistent with Sethi et al. (1978) Bansal et al. (2011) where the number of males outnumbered females., The possible reason for that may be a glorified status of the male in society and more expectations from males. However, worth noting is the narrowing of the gap between males and females in recent studies which may be due to the gradual upliftment of the socioeconomic position of women. Majority of the participants in the study were Hindus which was similar to the findings by Bharati et al. and most other Indian studies and literature., This may be due to the large Hindu population in the study area and cultural differences between the communities and different religious beliefs. About 74.5% of the participants were married, a finding similar to Das et al., 2008, Kumar., Marriage is a universal phenomenon in Indian culture, and Indian marriages are stable over the period. There are fewer divorces in our culture compared to the Western culture. This explains the above contradiction. Marriage is less protective against suicide for females than males, and the greater female vulnerability could be related to psychopathology and psychosocial stressors, including arranged and early marriages, youth maternity, lower social status, domestic violence, abuse, and economic dependence. In the present study, 58% participants belonged to the joint family and 42% belonged to the nuclear family which is consistent with many Indian studies. In a study by Ramdurg et al., 41% belonged to the nuclear family. The study completed by Bansal et al. reported 53% lived in a joint family. One popular belief is that suicide rates may be low in joint families secondary to the social, economic, and emotional support from the extended family; however, they might also suffer from interpersonal problems with co-members of the family and financial disputes which we observed in our study. In this study, we have around 7% of students, 8% unemployed, 27,5% homemakers which were clubbed into nonearning group (42.15%) and another group is earning group (57.85%), which includes 16.7% unskilled or semiskilled, 10.8% skilled, 23.5% consist of shopkeeper, farmer, clerk, and 7% professional. Individuals with employment had a higher suicidal rate than the unemployed persons, and also the level of stressors was more in employed persons. Tara and Rao, in her study, found that 55% of the suicide attempters were unskilled workers. This may be due to the fact that employed people face more stress at their workplace and also they may lack the coping skills required for facing the day-to-day stress factors. According to years of education, the results of our study show that both low and high educational status confers risk of suicide. However, the reasons seem to be different in these groups. The financial burden and poverty seem to be the reasons in participants with lower educational status, whereas unemployment and inability to meet the family and social demands may be the reason for educated participants. This finding is comparable to previous study findings. Narang et al. reported that the majority of the participant was educated up to matriculation and above, which was also the observation by Das et al. Ponnudurai et al. had assessed a similar group of participants over 1 year. Most of the studies in different countries have reported that lower social class is an important risk factor for suicide and attempted suicide. Narang et al. found that most (83%) of the suicidal attempts were from the low socioeconomic groups. Sahin et al. also found that 78.8% of the participants were from lower socioeconomic status. In this study, about 55% of participants belonged to poor economic status and had family income <10,000/month, which is consistent with previous studies. About 66% of individuals with suicide attempts had no diagnosable psychiatric illness. This proportion was about 50% in the study by Das et al. In a study, psychiatric diagnosis was present in eight participants (32.7%), which is in concordance with our study where 35 participants (34.3%) had psychiatric diagnosis. The above observations suggest that the significant number of suicide attempters have no significant psychopathology. They fail to cope with their stressors in a healthy way and suicide attempt is a cry for help. Promotion of healthy lifestyles, relaxation techniques, meditation, and timely intervention along with family support may be of great help in reducing such incidents. Among 34% of participants having diagnosable psychiatric illness, 21 individuals (20.6%) were diagnosed with adjustment disorder, 5 (4.9%) were diagnosed with depression, and 6 (5.8%) were diagnosed with substance dependence/harmful use which consisted of alcohol use disorder. Only two individuals (1.9%) were diagnosed with psychotic illness, and 1 (0.9%) was having bipolar disorder. In a study by Menon et al., adjustment disorder was the most common diagnosis (59%), which is replicated in our study also. Chronic physical illness was present in 20 individuals (19.6%), similar to another study where one-fifth were found to have a physical illness. The most common method adopted was 56 (54.9%) poisoning, followed by hanging 40 (39.2%), exsanguinations 5 (4.9%), and firearm injury in 1 (0.9%) by the suicide attempters. Similar observations were made by Chowdhary et al. and Eddleston., Poisoning was further divided into chemical (44.1%) and corrosive poisoning (10.8%). Chemical poisoning mostly includes pesticides. Most of the people were farmers in this region, and easy availability of pesticides may be the reason for its common use for suicide attempt. Violent methods, such as drowning and self-immolation, were not found. A study by Jain et al. has shown that violent suicide attempts are associated with higher suicide intent. Participants and their informants reported family problems, marital problems, financial issues, physical illness, and job-related and relationships problems among various antecedent events which precipitated the suicide attempt. The finding in the present study is consistent with NCRB data and a study done by Gade et al., where the most common reason of suicide was found to be family/interpersonal disputes (59.7%), followed by chronic medical illness (19.4%) and financial problems (15.3%). Seasonal differences in the rate of suicides have been documented for a long time with variously proposed hypothesis. It has been postulated that seasonal climate change can affect the rate of suicide. Many investigators have found peak rates of suicide in the spring, although data from other studies suggest a lack of association between seasonality and suicide attempts. Apart from this, these studies help in providing information on various prevention and modifying factors for suicide. The present study suggests that the maximum number of suicide attempts occur in the evening time. Similar finding was reported in a previous study where maximum incidents of suicide attempts have been reported in the evening. The individual concerned is likely to be in the company of family members in the evenings and quarrels due to interpersonal conflicts may possibly trigger the suicide attempt. This diurnal variation can be attributed to sociorelational factors or due to diurnal worsening of mood disorders. The present study findings suggest that interpersonal conflicts are the most common cause of suicide attempts. The other study from India gave a considerably wide time interval of 12 noon to midnight as the most common time for suicide attempts. Numerically, the highest proportion of suicide attempt in this population occurred on Saturdays followed by Sunday. Weekend suicides have been observed in many previous studies, their association with employment status, and alcohol use had been investigated. Another study from Israel had similar findings of Sunday as the day of peak rates of suicide attempts, though many other studies from the West have found Monday to be associated with peak rates of suicide., Indian society being agrarian does not subscribe to office-based week schedule starting from Monday. Therefore, additional stresses accumulated at the beginning of the workday after a weekend is not a matter of concern in this population. However, significant relationship of the day of the week with the suicide attempts was not found in this study probably as the significant proportion of the study sample belonged to a rural background. This study did not find a robust association between seasonality and suicide attempts, thereby endorsing the similar report from previous studies, while discordant with studies from many other parts of the world., This study suggested significant peak of suicide rates in extremes of weather which is around 20% in June and July which are very hot months of summer in North India and around 21% in December and January which are very cold months of winter in this region of the country. While the only other study from India, which commented on seasonality of suicide rates found increased rates of suicides in the rainy season (typically June–August in India). Our study indicates that temperature and sunlight duration are specifically associated with the probability of a suicide attempt. This was a time-bound, hospital-based study with a limited sample size; hence, it may not be representative of persons who attempted suicide in the general population. Responding to an authority like physicians may be intimidating to the patients, thus anonymous population surveys may provide different data. Most of the participants included in the study were aged 31–45 years. Our sample consisted of almost equal number of males and females. Most of the males belonged to earning group having mean income of Rs. 7135/month. Most of the participants were Hindus, belonged to the joint family, married having family income < Rs. 10,000/month and almost equal number of sample was from urban and rural background. Most of the women belong to homemakers' category and clerk/shop owner/farmer formed the major occupational group. Psychiatric illness is present in about 34% of participants. Among psychiatric illness, adjustment disorder was the largest entity followed by substance use disorder and depression. Chronic physical illness was present in 20% of participants. Poisoning remains the most common method adopted for suicide attempt. Family conflicts and marital problems remain the most common precipitating factors reported as antecedent event by the subject or informants. Majority of participants had low suicide intent. Most of the individuals attempted suicide in the time period between 6:00 PM and 11:59 PM, on weekends (Saturday and Sunday) and extreme of weathers, in December, January and June, July which also corroborates socioculturally to the vacation time. Organization WH. Public health action for the prevention of suicide: A framework. 2012. See flyer SUPRE (Suicide Prevention); Geneva, Switzerland; 2014. p. 2. Organization WH. International statistical classification of diseases and related health problems. Vol. 1. Geneva, Switzerland: World Health Organization; 2004. Reddy DN, Mishra S, editors. Agrarian crisis in India. Oxford University Press; 2010. Das A. Farmers' suicide in India: Implications for public mental health. Int J Soc Psychiatry 2011;57:21-9. Bansal P, Gupta A, Kumar R. The psychopathology and the socio-demographic determinants of attempted suicide patients. J Clin Diagn Res 2011;5:917-20. Ajdacic-Gross V, Wang J, Bopp M, Eich D, Rössler W, Gutzwiller F, et al. Are seasonalities in suicide dependent on suicide methods? A reappraisal. Soc Sci Med 2003;57:1173-81. Sheehan D, Janavs J, Baker R, Harnett-Sheehan K, Knapp E, Sheehan M. Mini International Neuropsychiatric Interview (Version 6.0. 0). Tampa, USA, Paris, France: Centre Hospitalier Sainte-Anne, University of South Florida College of Medicine; 2009. Menon V, Kattimani S, Sarkar S, Sathyanarayanan G, Subramanian K, Velusamy SK, et al. Age at onset of first suicide attempt: Exploring the utility of a potential candidate variable to subgroup attempters. Asian J Psychiatr 2018;37:40-5. Sethi BB, Gupta SC, Singh H. Psychosocial factors and personality characteristics in cases of attempted suicide. Indian J Psychiatry 1978;20:25. Bharati S, Mallik S, Datta PP, Mukhopadhyay A, Datta D, Haq S. Socio-demographic profile and suicidal intent of attempted suicide cases: A hospital based study in West Bengal. Natl J Med Res 2013;3:122-5. 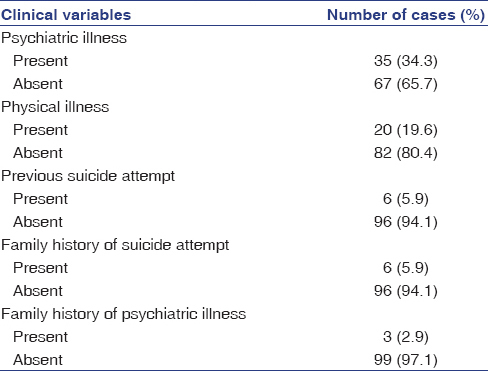 Ramdurg S, Goyal S, Goyal P, Sagar R, Sharan P. Sociodemographic profile, clinical factors, and mode of attempt in suicide attempters in consultation liaison psychiatry in a tertiary care center. Ind Psychiatry J 2011;20:11-6. Das PP, Grover S, Avasthi A, Chakrabarti S, Malhotra S, Kumar S, et al. Intentional self-harm seen in psychiatric referrals in a tertiary care hospital. Indian J Psychiatry 2008;50:187-91. Kumar PN. Age and gender related analysis of psychosocial factors in attempted suicide. Indian J Psychiatry 1998;40:338-45. Tara R, Rao VR. Study of psychiatric co-morbidity and associated psychosocial stress in attempted suicide patients. Int J Curr Res Rev 2014;6:29-34. Narang RL, Mishra BP, Nitesh M. Attempted suicide in Ludhiana. Indian J Psychiatry 2000;42:83-7. Ponnudurai R, Jeyakar J, Saraswathy M. Attempted suicides in Madras. Indian J Psychiatry 1986;28:59-62. Sahin HA, Sahin I, Arabaci F. Sociodemographic factors in organophosphate poisonings: A prospective study. Hum Exp Toxicol 2003;22:349-53. Menon V, Kattimani S, Shrivastava MK, Thazath HK. Clinical and socio-demographic correlates of suicidal intent among young adults: A study from South India. Crisis 2013;34:282-8. Chowdhary AN, Banerjee S, Brahma A, Biswas MK. Pesticide poisoning in nonfatal, deliberate self-harm: A public health issue. Indian J Psychiatry 2007;49:117-20. Eddleston M. Patterns and problems of deliberate self-poisoning in the developing world. QJM 2000;93:715-31. Gade V, Kalasapati LK, Sharma V. Socio-demographic profile and suicidal intent in suicide attempters: A cross sectional study from a teaching hospital in India. Int J Sci Res 2018;7:63-8. Jain V, Singh H, Gupta SC, Kumar S. A study of hopelessness, suicidal intent and depession in cases of attempted suicide. Indian J Psychiatry 1999;41:122-30. Kanchan T, Menezes RG. Suicidal poisoning in Southern India: Gender differences. J Forensic Leg Med 2008;15:7-14. Kattimani S, Penchilaiya V, Sarkar S, Muthukrishnan V. Temporal variations in suicide attempt rates: A hospital-based study from India. J Family Med Prim Care 2016;5:357-61. Preti A, Miotto P. Diurnal variations in suicide by age and gender in Italy. J Affect Disord 2001;65:253-61. Logaraj M, Ethirajan N, Felix JW, Roseline FW. Suicidal attempts reported at a medical college hospital in Tamil Nadu. Indian J Community Med 2005;30:136-7. Modan B, Nissenkorn I, Lewkowski SR. Suicide in a heterogeneous society. Br J Psychiatry 1970;116:65-8. Johnson H, Brock A, Griffiths C, Rooney C. Mortality from suicide and drug-related poisoning by day of the week in England and Wales, 1993-2002. Health Stat Q 2005;27:13-6. Maldonado G, Kraus JF. 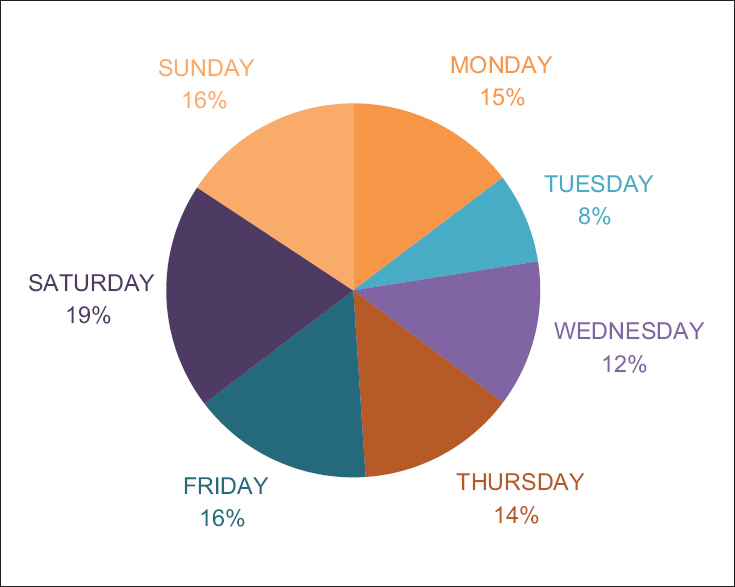 Variation in suicide occurrence by time of day, day of the week, month, and lunar phase. Suicide Life Threat Behav 1991;21:174-87. Tietjen GH, Kripke DF. Suicides in California (1968-1977): Absence of seasonality in Los Angeles and Sacramento counties. Psychiatry Res 1994;53:161-72. Christodoulou C, Douzenis A, Papadopoulos FC, Papadopoulou A, Bouras G, Gournellis R, et al. Suicide and seasonality. Acta Psychiatr Scand 2012;125:127-46. Jessen G, Jensen BF, Arensman E, Bille-Brahe U, Crepet P, De Leo D, et al. Attempted suicide and major public holidays in Europe: Findings from the WHO/EURO multicentre study on parasuicide. Acta Psychiatr Scand 1999;99:412-8. 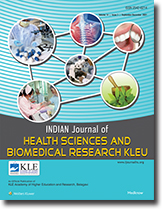 Mohanty S, Sahu G, Mohanty MK, Patnaik M. Suicide in India: A four year retrospective study. J Forensic Leg Med 2007;14:185-9. Chandrasekaran R, Gnanaselane J. Correlates of suicidal intent in attempted suicide. Hong Kong J Psychiatry 2005;15:118-22.